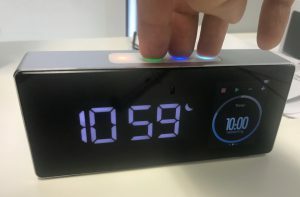 Wondering how to use certain features on your Oboo Smart Clock? You’ve come to the right place! How do I set this up for the very first time? I thought there was supposed to be a mobile app? What is up with the software? How come ______ feature doesn’t work? What can I expect to be working at this moment? What is the latest available version of Oboo software? I think my Oboo doesn’t charge when it’s plugged in! Why is my battery indicator showing empty all the time? What are the buttons on the screen? Is it supposed to be a touchscreen?? The buttons aren’t very responsive! 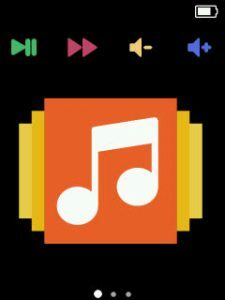 How do I play music over Bluetooth? 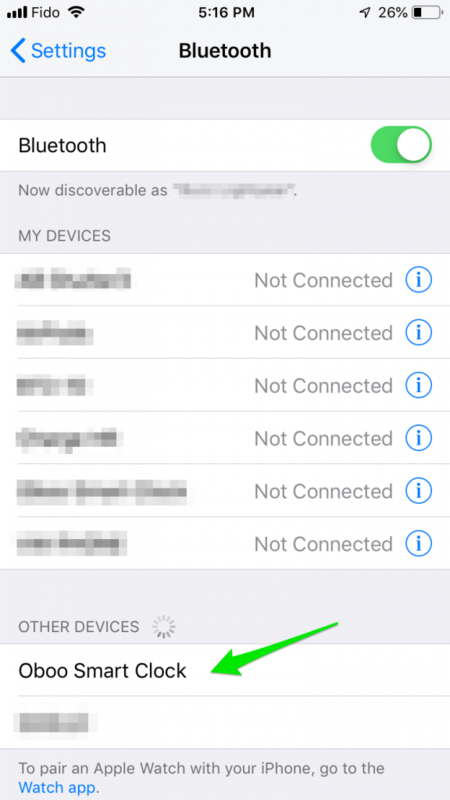 How do I Bluetooth pair a different device? How do I change the volume? How do I change _____ setting? How do I update my Oboo’s time and date? Can I reset my Oboo’s WiFi to the default settings? How do I snooze or turn off an alarm? How do I check the version of my Oboo’s software? 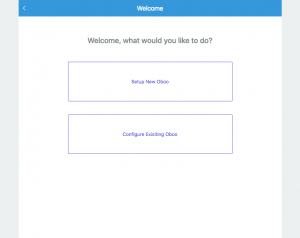 You can use the Oboo Web App at http://setup.getoboo.com/ to set up your Oboo the very first time. For the moment, we recommend using a desktop internet browser. 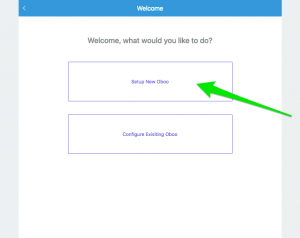 Once you reach the Oboo Web App, select Setup New Oboo and follow the steps. Software development is still in progress and updates are being rolled out on a continuous basis! Check out our Software Status page for details. If you’ve just gotten your Oboo and it’s behaving particularly buggy, it’s likely that the software is super out of date – make sure your Oboo is connected to WiFi and try updating your software manually, or waiting a little while: every Oboo is configured to check for and install software updates on a weekly basis. Check out our Software Status page for details. When plugged into power, the battery logo will not change to indicate that the battery is charging. Please try leaving your Oboo plugged in for a few hours and then checking the battery level. It sounds like your Oboo is running an old version of the software. There was a software bug in earlier versions that made the battery level reading quite inaccurate. Try updating your Oboo’s software! Oboo’s info display is not a touch screen. The “buttons” on the screen correspond to the buttons on the touch-bar that’s on the top-side of your Oboo. You’ll notice each button is color matched to actions displayed on the screen. It sounds like your Oboo is running an old version of the software. More recent versions of the software have better sensitivty calibration for the buttons. From there, you can use it like any other Bluetooth audio device! 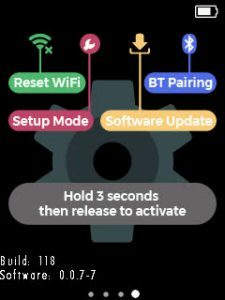 Enter Bluetooth Pairing mode by pressing the button corresponding to BT Pairing for 3 seconds and then releasing. or the blue touch-bar button to raise the volume. This can be done through the Oboo Web App’s Configure Existing Oboo page. 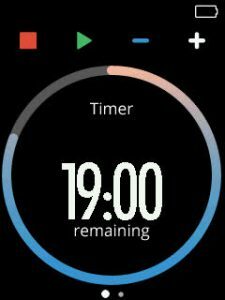 Hit the Sync Time button and your Oboo’s time and date will be updated to that of your computer or phone. You’ve changed the password of your Oboo’s WiFi network and can’t remember it. Press the button corresponding to Reset WiFi for 3 seconds and then release. This can be done through the Oboo Web App’s Configure Existing Oboo page. 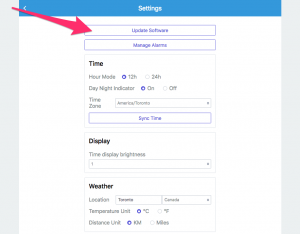 Hit the Manage Alarms button to create new alarms and edit or disable existing alarms. When the alarm is going off, you can either snooze or turn off the alarm. To snooze the alarm for about 10 minutes, wave your hand in front of the Clock. To turn off an alarm, touch any of the buttons on the touch-bar. The current software version is at the bottom of the Card. In the screenshot above, the version is 0.0.7-7. 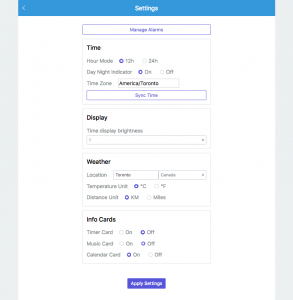 When your Oboo has been connected to WiFi, go back to the Oboo Web App, available at http://setup.getoboo.com/ and hit the Configure Existing Oboo button to reach the settings page. The update will take a few minutes. Start a software update by pressing the button corresponding to Software Update for 3 seconds and then releasing. The update will take a few minutes. If this method doesn’t work for you, try using the Oboo Web App to update instead.